Dramm introduces new Low Pressure JetRain Nozzles. Seeking to offer more flexibility in its effective JetRain Nozzle System, Dramm now offers two different check valves for a wider range of pressures. Growers may choose either a 15-50 psi check valve or a 50-70 psi check valve. The new system places the check valve outside of the nozzle body by using press-to-fit connectors. The JetRain still offers either a barbed or threaded connection and can be used without the check valve when mounted upright. 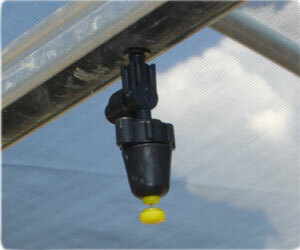 The JetRain Nozzles come in several different flow rates and pattern sizes for unmatched evenness of pattern in mist propagation and overhead irrigation. Please email us or check out the JetRain system web page for more information.